You must make bookings at least 5 minutes in advance of the time at Portrait Restaurant. The restaurant is closing at 5.30pm as the building is closing at 6pm from Sunday to Wednesday and at 10.30pm from Thursday to Saturday. Entrance to The Portrait Restaurant on Thursday and Saturday evenings after 18:00 would be via Orange Street. Please be advised that reservations for Saturday evenings can only be made 6 weeks in advance. 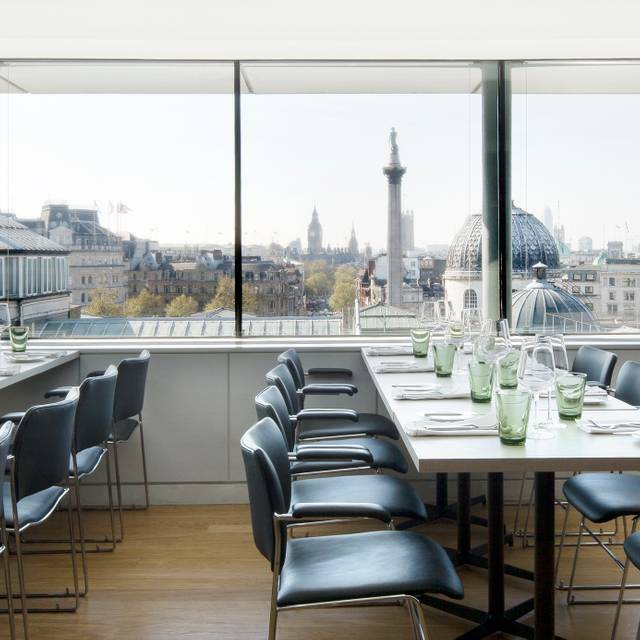 The Gallery’s rooftop restaurant has one of the most enviable views in London. 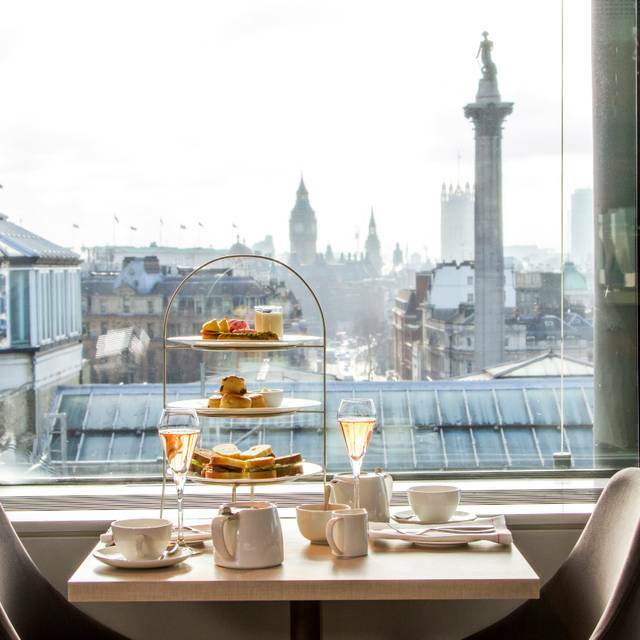 Here you can enjoy breakfast, lunch, afternoon tea or dinner alongside an unparalleled view of Nelson in Trafalgar Square and across Whitehall to the Houses of Parliament, Big Ben and the London Eye. 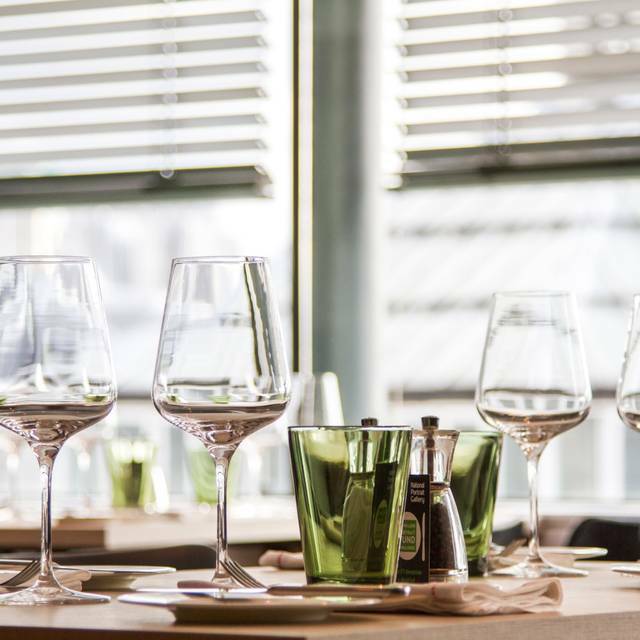 It is a smart, stylish place to enjoy dishes based on superb seasonal ingredients we source from the country’s most esteemed suppliers, for instance, smoked salmon from West Country sustainability champions Severn & Wye, plus Portland crab, Devon Rose veal, and venison from the Royal Estates. We support local producers when it comes to drinks too, serving Chapel Down English wines from Kent, and beers from London’s Meantime brewery. Have just met a dear friend for a long and leisurely lunch at the Portrait Restaurant at the National Portrait Gallery. Am pinching myself having found the perfect restaurant, that nobody seems to know about! 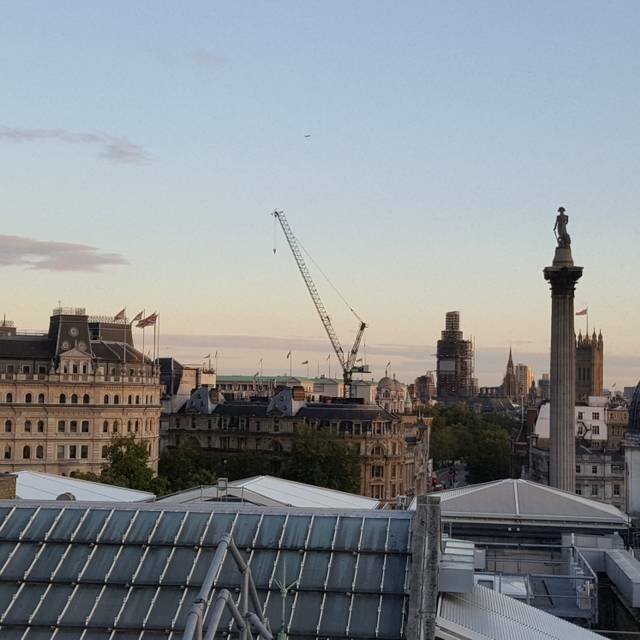 Incredible location, gorgeous view across the rooftops toward Lord Nelson and Big Ben in the distance. However, even more impressive is the food! Gin and Tonics followed by delicious ribeye steaks and chips, and rhubarb crumble. Will definitely return, probably before April is out! My new favourite restaurant for meeting up with old friends. It really is worth the visit. Wonderful lunch venue. Good buzzy atmosphere, delicious food, top service. I love restaurants where everyone is chatting - sure sign that they feel at ease - and the Portrait is a perfect example. Will be back next time we’re in London. We were particularly impressed by our waitress, who told us she came from Prague. Her English was excellent and she was very welcoming, cheerful and efficient. Convenient for Pre theater dining, and decent food choices. A bit too salty but otherwise good food. Unexpected gem at the top floor of the (also excellent) National Portrait Gallery. We had a two-course set lunch which seemed a bit expensive at £29 per person, but the quality of the food was superb and the overall experience was so positive that it actually seemed like a bargain. 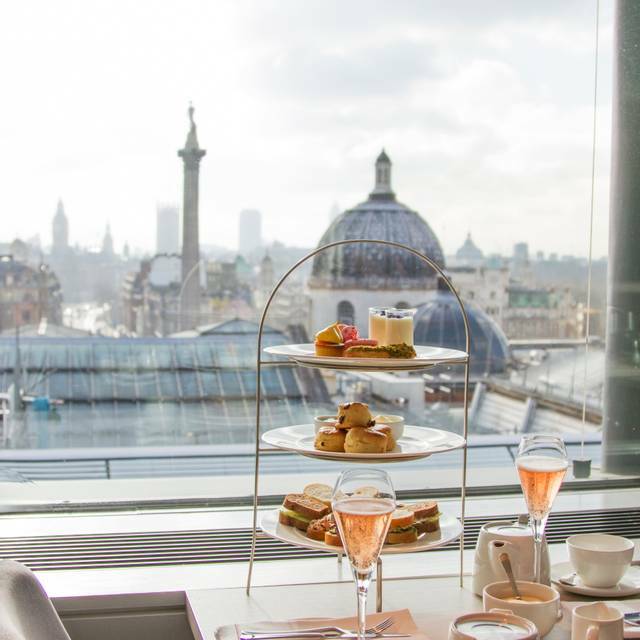 The view across the roof tops of the National Gallery to Trafalgar Square and Whitehall alone would have justified the charge. Overall a great lunch experience, good service, great food and unrushed. Will definitely return. Great food. Great service. Fantastic view. The pre-theatre menu was excellent value. I love this restaurant. I have only ever been for the pretheatre dinner but have never been disappointed in the food or the service. The view is lovely from any table and friends who had not been before were impressed and said they will return. The wine list is good, if a little pricey. There is something for even the fussiest wine drinker, and we had one of those. I will definitely return next month with another group of people. Amazing service, reasonably priced. Would certainly go again. Stunning view makes it a very positive visit. And the gallery before of after is always worthwhile. Service was slow to start with - took about 20 mins for our drinks to arrive; after that things improved. Food is excellent and pre-theatre menu, whilst restricted choices, is good value. Drinks are quite pricey though! Great afternoon tea and service. Memorable view over Trafalgar Square towards Whitehall. Highly recommended. Booked online and requested a window seat which we got. Beautiful day and gorgeous views. Enjoyed a Bellini before tea. Only grouse would be that we had to wait half an hour for some tea - a misunderstanding as the waiter thought we wanted to finish our glasses of fizz first, which we had not said. Overall a lovely place and a lovely treat for afternoon tea. 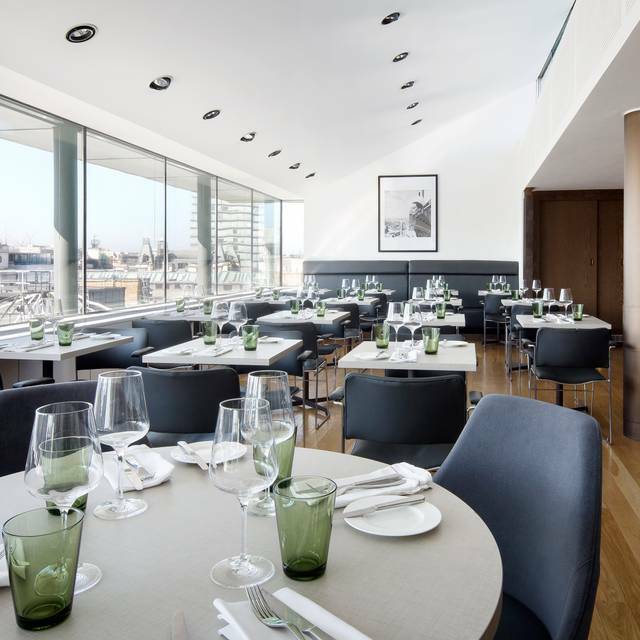 Excellent food, attentive service, wonderful views over the London skyline; but a little pricy, especially the wines. Worth doing every so often, though. It was a lovely experience! All the Portrait staff were welcoming, efficient, enthusiastic and friendly. It makes such a difference. The atmosphere was buzzing at this lunchtime service with almost every table taken. The menu was well-judged and fairly priced - we chose 2 courses from the set menu. We were keen to eat within an hour due to an exhibition timed entry, our lovely waitress assured us that would by fine and it was, with no rush. We were well looked after throughout the meal, menus came quickly, followed by drinks and the food delivery was well paced. I can’t fault it and will definitely return. Thank you! 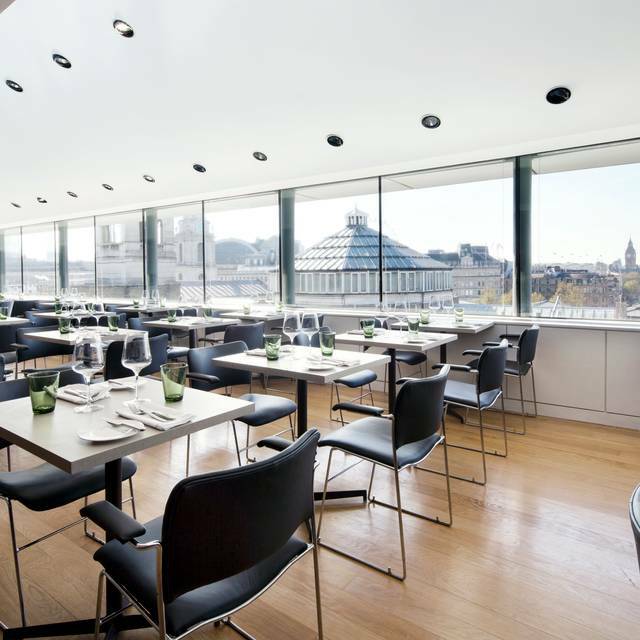 This is a cozy dining space with wonderful views of the skyline over the Portrait Gallery. The service is extremely professional and the food was excellent. Wonderful service, gorgeous food and views after an afternoon of art & what more could you ask for? It was our first day in London. Our transatlantic overnight flight landed in the morning and I knew we had to stay awake as long as we could if we were to enjoy our week in the city. So I planned a walking tour from our Bloomsbury hotel to the British Museum and on to the National Portrait Gallery ending with a mid afternoon lunch. It was perfect. 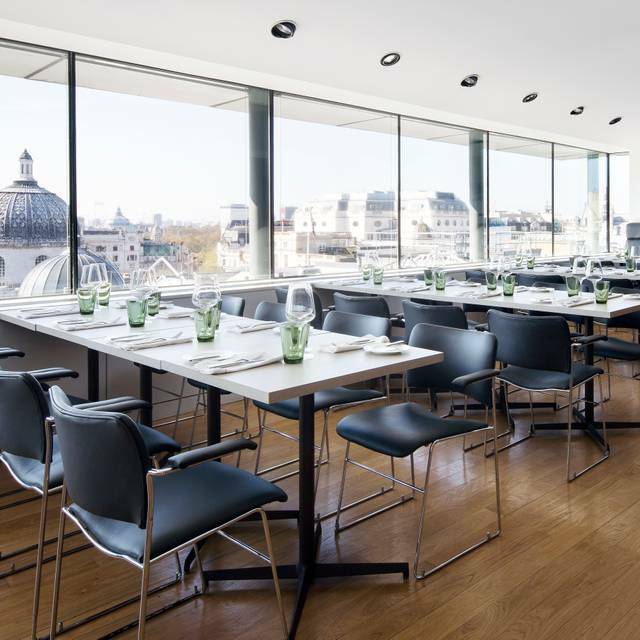 We were awake, the food was lovely, the chitter chatter from the busy tables kept us going and the view of the buildings around Trafalgar Square from our window table gave us something to talk about. So thank you, one and all, for a perfectly wonderful start to our holiday. Lovely quality tasty food and so well presented . We had a set menu and 2 course which was reasonably priced . Lovely views of London . We had a good evening at the restaurant. We had only been for lunch before but had always found it to be good. The downsides were that it was more noisy than usual and that they didn't seem to have our booking (obviously through Open Table). Otherwise the food and service were good and our guests enjoyed it too. We would go again. Had a delightful brunch and the staff could not have been nicer. Will go again. Superb pre-theatre meal- gorgeous setting, relaxed, and delicious. Lovely to be above the pre-theatre hubub on the West End, yet minutes away from our theatre. Always a pleasure to eat at The Portrait Restaurant. Delicious food served in such a wonderful setting. The pre-theatre menu is such good value. One of my favourite places to eat in theatreland. Thoroughly enjoyed our meal. Smoked mackerel starter was heaven. Good value food with expensive drinks. Can't wait to go again. 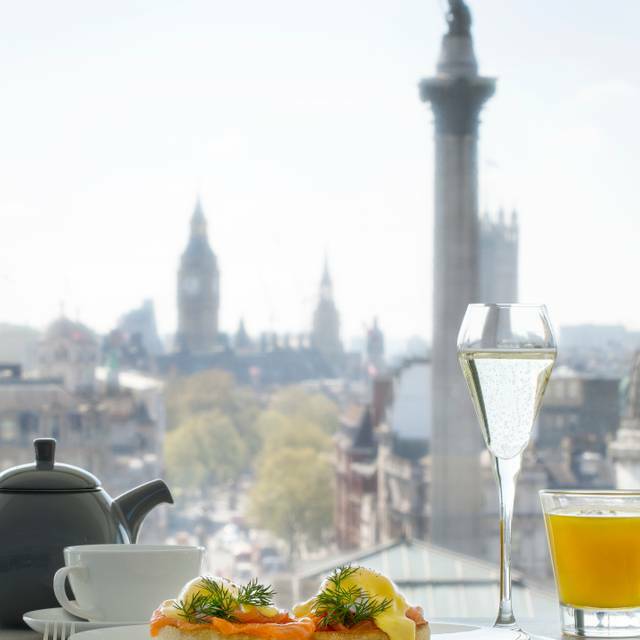 The great combination of a glorious view with superb, professional service and very good food. Sadly there wasn't enough time (or room left) to sample the desserts. My guest was both impressed and delighted, and is determined to come again. As am I! Very good experience... we were lucky to have a table by the window... in any case all tables look to be in good position to have the view... the food was excellent... service very good and friendly.... we had a very good lunch time. Lovely restaurant to meet a girl friend for a delicious, light bite to eat in a delightful, bright setting. Staff are amazing and there is no pressure to eat a 3 course meal. Had the pre-theatre menu and there were three choices per course - vegetarian, fish-based and meat-based which I guess is standard fare but we struggled to find a starter that really appealed so we just had a main and dessert. Wine menu wasn't extortionate. Atmosphere is great even if a little noisy. Service was top class. Pre-theatre dinner - lovely restaurant with good views and atmosphere. Tasty well presented food and very good and prompt service from some excellent waiting staff. Great value and ideally placed for Theatreland. Lovely ambience and service. A bit pricey hence a special occasion place. Could do with another vegetarian main choice in the Set Menu. Wonderful service and atmosphere and views and fabulous food! Great service, superb location, interesting menu, and a thoroughly enjoyable evening! A view to die for. Friendly and efficient staff. Menu has limited choices but we found a main course pheasant and a pudding poached pears which we very much enjoyed. Would recommend you book in advance. Enjoyed it as always...love the view, ambiance, relating to staffand food. Staff always know about the menu and staff are always fiendly and enthusiastic. Like the menu and the way it changes. Altho it isn’t the Shard you feel on top of the world there! I always have a meal there when I go up to London from rural Dorset. It was our first time here and we were impressed. The ambiance is lovely and the service excellent. We had the pre-theatre menu which was both delicious, and good value. The only negative was the lack of toast with the game rillette - just one tiny piece for a slice of rillette. The chocolate/salt caramel dessert was to die for. Friendly efficient staff, excellent food for Brunch especially, on this occasion, crisp bacon and perfectly poached fresh eggs and good coffee. This is a very relaxing and unpressurized ambience before hitting the galleries and the view is always a bonus.